Happy days are almost here again! Wednesday, the wine tastings resume at the Belfry Bistro. As we prepare for our Valentine’s Day guests at our Cape Cod bed and breakfast, I am still looking for the right wines to serve. While waiting for the formal tasting to start, I have been informally exploring wines that cross my path. A Christmas gift of wine from guests that have become good friends brought back a flood of childhood memories. No, I did not start drinking wine when I was that young, but all wines have a story to tell. Kevin and Lynne from Canada have stayed with us many times over our nine years here, the last time was this past 4th of July, but that is another story. Kevin is an amateur wine maker and always brings us a few bottles of his latest vintage. Our routine is to sample one of the new ones along with one from his last visit. For the occasion I invite other wine loving friends for what has become know as Wine Patio. I then cellar the remaining new ones until Kevin and Lynne return. I knew Kevin had a temporary work assignment in California and I knew he and Lynne would take advantage of their proximity to great wine country. Right before Christmas a packaged arrived with brochures and wine guides from Santa Barbara to Napa Valley that confirmed they visited a lot if wineries. How envious am I? They teased me with the documentation of their travels, but also included two bottles of wine. The first was a 2010 Charles Shaw Cabernet, which I know Kevin included as a joke. Charles Shaw was first widely distributed in Trader Joe stores at a ridiculously low price and is infamously known as Two Buck Chuck. Unfortunately, the level of quality is also reflected in the price. I’ll save this one for Kevin’s next visit. 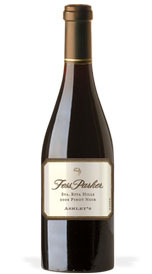 The second wine was a 2008 Fess Parker Santa Rita Hills Ashley’s Pinot Noir. In no way is this a joke and I could not wait to taste it, sorry Kevin. The Fess Parker Winery is in Los Olivos, California in the Santa Barbara Wine Country made famous by the Sideways movie about Pinot Noir. This was a great bottle of Pinot, but the flash back of memories for me is the Fess Parker name. Who growing up in the 1950s and 1960s does not remember Davey Crocket and Daniel Boone? Fess Parker was a TV actor that portrayed both these historic frontiersmen and inspired the sale of millions of coonskin caps and buckskin jackets with fringe. I wish I could find that picture of me marching in the 1955 Palatine Illinois Centennial parade in my cap and jacket my mother made for me carrying my antique 22 rifle pretending to be a mini Davey Crocket. Fess Parker is gone, passing away in 2010 at age 85, and his family continues to run the winery and are making some great wines. If you visit the winery you will see a lot memorable from the Crocket/Boone era. So a great bottle of wine has brought me a flood of great memoirs. Come stay at our Sandwich Inn and we can share a bottle of wine and create new memories.